Some people attribute the presence of mites on dogs to be a result of the exposure of the canine to unhygienic conditions. Mites are tiny insects that can not always be seen by the human eye. However, this insects even occur on dogs that are healthy and hygienic. These insects are very tiny, in fact, microscopic and always burrow under the skin of the canine where they lay eggs and multiply rapidly. However, when the population of this insects begins to swell on the dog, they come with certain symptoms like inflamed and reddened patches of skin. This is followed by scratching, which causes a lot of discomfort in the dog. Mites can also affect certain parts of the canine’s body like the ears. Since this insects are not always visible to the human eyes, it is important to know the symptoms. In the event that your dog has ear mites, you will notice a certain kind of odor coming from the ears while the canals of the canine’s ears will appear red and irritated. Different means of preventing ear mites on dogs have been developed. Natural treatments have been in use for a long time. On other articles on this site, we also look at a few modern treatments for dogs with Demodectic Mange infestation. The steps listed below could be very useful when looking for an ideal and inexpensive way of offering treatment to pets with mites. One popular ear mites in dogs treatment that is all natural is mineral oil. Put the mineral oil into an eye dropper, then place about three or five drops of the warm mineral oil into the ear canal of the canine. 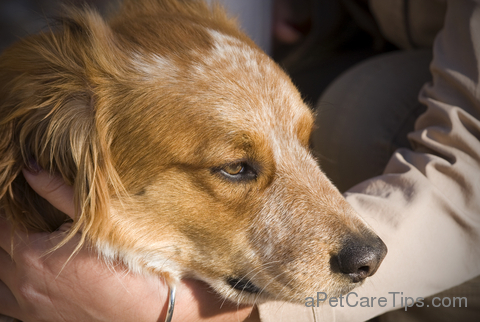 You can massage the canine’s ears gently to ensure that the mineral oil is worked in. To give time for the mineral oil to take effect, wait for about two hours and then wipe the ears of the dog using a cotton wool or even a tissue paper. It is advisable to repeat the procedure twice every week for not less than three weeks for better results. Another procedure used for skin mites on dogs is rubbing on a soothing ointment. The ointment can be made by combining a cup of calamine lotion, a cup of aloe vera gel and another cup of soluble sulphur. Mix the ingredients until they are properly blended and then place the mixture in a large pan. Add one gallon of distilled water to the mixture and begin to boil. Reduce the heat after the mixture has boiled and then allow it to simmer for 30 minutes. After the mixture has cooled off, take it and apply it to the dog’s fur. Ensure that the mite treatment is applied properly all over the body of the canine including the legs and even between the toes. Do not rinse the mites treatment but just let it dry naturally. You may need to repeat the process once in every week for about one month. Apart from the above-mentioned mite treatments, there are other treatment methods that can be used on pets with mites such as washing the canine in medicated shampoo, and rubbing on acne creams among others. Again, because skin mites are hard to see, watch for the symptoms so you can begin early treatment before the infestation of these small parasites grows.